Joel and Damon discuss and preview the NJPW Anniversary show. On this week’s Super J-Cast, Joel and Damon discuss and review both nights of NJPW/ROH’s Honor Rising shows. Joel and Damon preview the ROH Honor Rising shows along with the Takashi Iizuka retirement show. Joel and Damon discuss the historic New Beginning in Osaka show with a full review of the show and the Jay White / Hiroshi Tanahashi main event. Joel and Damon empty out the Twitter and Discord boxes and dedicate the show to answering as many as possible. Wrestle Kingdom 13 is in the books and both Joel and Damon are in Tokyo to give you a first-hand review of both Wrestle Kingdom and New Year Dash! On this week’s Super J-Cast, we are joined by the voice of New Japan Pro Wrestling on NJPWWorld and AXS-TV, Kevin Kelly. You voted…and now it is time for the Super J-Cast 2018 Awards! On this edition of the Super J-Cast, Joel and Damon continue on to the WTL 2018 finals on December 6th. On this edition of the Super J-Cast, Joel and Damon catch you up on the WTL 2018 giving match ratings and the +/- so far. On this edition of the Super J-Cast, Joel and Damon preview the 2018 NJPW World Tag League. Joel and Damon review the 2018 Power Struggle show, discuss rumors involving Shinsuke Nakamura and Juice Robinson, drop praise on Shingo Takagi & more! Joel and Damon discuss recent NJPW news with Kenny Omega and the Young Bucks, Western influences and much more! In this week’s slightly abridged Super J-Cast, Damon and Joel give their instant reaction to King of Pro Wrestling 2018. On this edition of the Super J-Cast, Joel and Damon review the Destruction shows from Beppu and Kobe. On this edition of the Super J-Cast, Joel and Damon give their review of the historic All In show from Chicago. On this special Super J-Cast, Joel and Damon take YOUR questions: Chris Jericho, IC Title, state of the Jr title, MSG predictions, fantasy booking and more. Joel and Damon finish off G1 Climax 2018 reviewing all the big matches from the past week. Joel and Damon sit down once again with Fraser Marriott who has set out to attend each and every G1 Climax show this year. On this 2 hour Super J-Cast, Joel and Damon catch you up with G1 Climax reviewing all the big matches from nights 8 thru 11. On this special edition of the Super J-Cast, Joel and Damon sit down with Fraser Marriott who has set out to attend each and every G1 Climax show this year. On this week’s edition of the Super J-Cast , Joel and Damon catch you up on the opening three nights of G1 Climax 28. On this episode of the Super J-Cast, Joel and Damon review night two of the Strong Style Evolved UK shows as well as the G1 Special 2018 from San Francisco. Joel and Damon review the NJPW X CEO event, night one of the SSEUK weekend, Kenny Does A Thing, music Damon returns and World Cup hot takes. Shows in the UK with Rev Pro, the Cow Palace situation and line-up, Kenny Omega’s recent comments and reactions, Fashion Files with David Finley and more. This week on the Super J-Cast: Joel and Damon catch you up on G1 Climax 28 news, review the Kizuna Road shows from Korakuen Hall and more! This week Joel and Damon give you first-hand reactions and opinions on the historic Dominion 6.9 show, what is next for Kenny Omega, the recent North American invasion, Young Bucks as WOTY, and so much more! In this week’s edition of the Super J-Cast: Joel and Damon give a full review of BOSJ, preview the mega Dominion show, answer more listener questions, and give you the secrets to being crowned King of Memes. Clocking in at over 2:30! 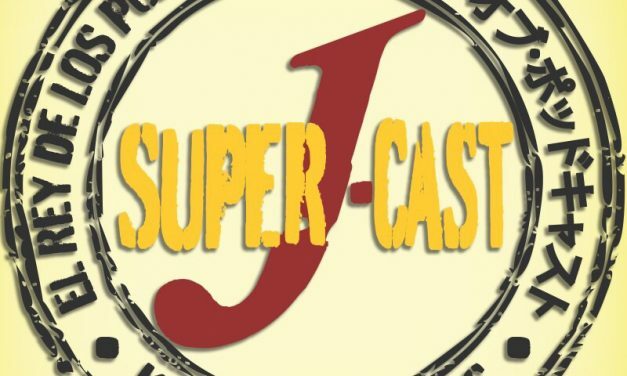 In this week’s edition of the Super J-Cast, Joel and Damon discuss Days 3-7 of the BoSJ, fussy eaters, mental health issues, inclusivity in the LIJ community and what Sergio Ramos and Taiji Ishimori have in common. In this week’s edition of Super J-Cast , Joel and Damon have you covered for night one and two of BOSJ, we touch on the All In sell out and the lack of sell out status for the New Japan show in the US, plus Lion’s Gate talk, more Strong Zero bets, and your answers to your burning questions. Joel and Damon discuss the upcoming Best Of The Super Junior tournament and give our takes on the winners of Block A and B, key matches to look forward to and projected standings. The boys also preview the Lion’s Gate show this week and continue the discussion on the upcoming Dominion lineup. On this week’s Super J-Cast, Joel and Damon review the two Wrestling Dontaku shows from last week and also discuss the build to Dominion. All this plus BOTSJ talk and a whole lot more!